Emerging Infections is a reprint of the inaugural volume of the thematic serial, Biomedical Research Reports Series that provides annual updates on hot topics of interest to a broad spectrum of the biomedical research community. This volume provides state-of-the-art reviews of the most important "new" and reemerging bacterial, viral, and parasitic infections, their life cycles, host defense evasion strategies, and clinical features. 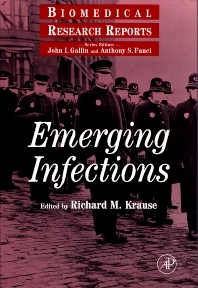 Emerging Infections includes in-depth coverage of the history of infectious disease outbreaks, population and evolutionary biology of human pathogens, and current epidemiological models that describe how ecological and demographic changes produce new epidemics. The book covers the major established pathogens as well as the new and sensational--mad cow disease, hantavirus pulmonary syndrome, pathogenic E-coli, and flesh-eating bacteria. Basic and clinical researchers in immunology, microbiology, infectious disease, and public health. National Institutes of Health, Bethseda, Maryland, U.S.A.